Howlin' Wolf Records: SIX STRINGS: Intrada: BUCK ROGERS IN THE 25TH CENTURY - SEASON TWO (4CD)!!!!! 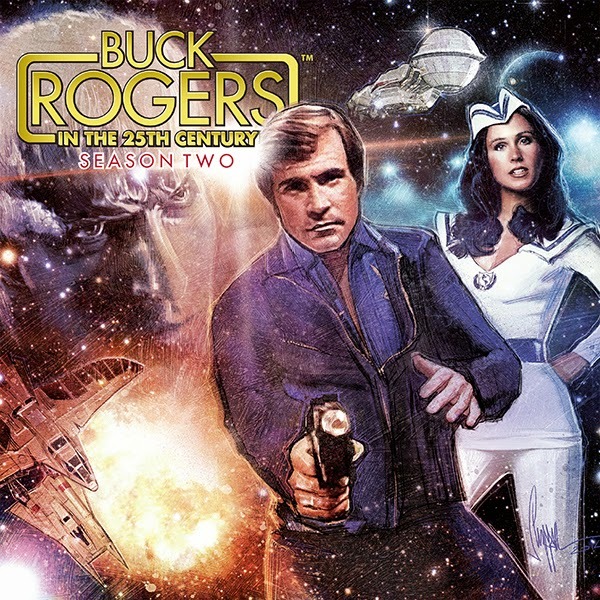 Intrada: BUCK ROGERS IN THE 25TH CENTURY - SEASON TWO (4CD)!!!!! Intrada follows its previous release of Buck Rogers in the 25th Century, Season One with a four-disc set focusing on Season 2. The music for Buck Rogers’ second outing was similarly a mix of old and new, as the show was considerably different from its first season. Larson’s title theme was retained (albeit with new narration), and the roster of composers included the familiar names of John Cacavas, Herbert Donald Woods and Galactica veteran Stu Phillips, who had scored the pilot film. New to the mix and scoring the majority of episodes was composer Bruce Broughton. Broughton ultimately scored more than half of Buck Rogers’ second season, beginning with the premiere. “I remember talking with John [Mantley -- new producer] about the show, and the direction he intended it to take. His stories didn’t revolve around science fiction as much as around people in interesting situations. As a result, the shows on the second season are probably a little more old-fashioned than the first, but for me they lent themselves to interesting dramatic and musical opportunities," commented Broughton in the album's liner notes. The result is the show incorporated more dramatic scoring and less lightweight material than Season One, resulting in more thematic structure and shape with numerous action sequences and colorful orchestrations to spare. To premiere the music from Season Two, Intrada had access to Universal’s three-channel stereo scoring session masters for every episode included in this album. The second season of Buck Rogers is very different from the first season. The retooling of season not only included new writing, but gone was the Earthcentric setting; Buck and crew would now voyage across the galaxy on the starship Searcher, seeking out “lost tribes” of Earth. Gone were the venerable Dr. Huer (Tim O’Connor), the lustful Princess Ardala (Pamela Hensley) and the formidable Kane (Michael Ansara). Buck himself remained, as did Col. Wilma Deering (Erin Gray). Comical android Twiki (Felix Silla) survived in a reduced role, and bereft of his AI counterpart Dr. Theopolis (Eric Server). New characters included Admiral Asimov (Jay Garner), a descendant of author Isaac Asimov; congenial scientist Dr. Goodfellow (Wilfrid Hyde-White); an insufferable robot named Crichton (voiced by Jeff David); and the birdman Hawk (Thom Christopher), an adversary who becomes Buck’s trusted ally. Just Announced! Yes, 4 cd's of music... that is just awesome... now say that a bunch of times and go get this collection! I'm sure it's as cheesy as hell now, but I need to watch that series again. Used to have such a crush on Erin Gray.